The main issue is that the game really pushes the limits of "bare-bones". 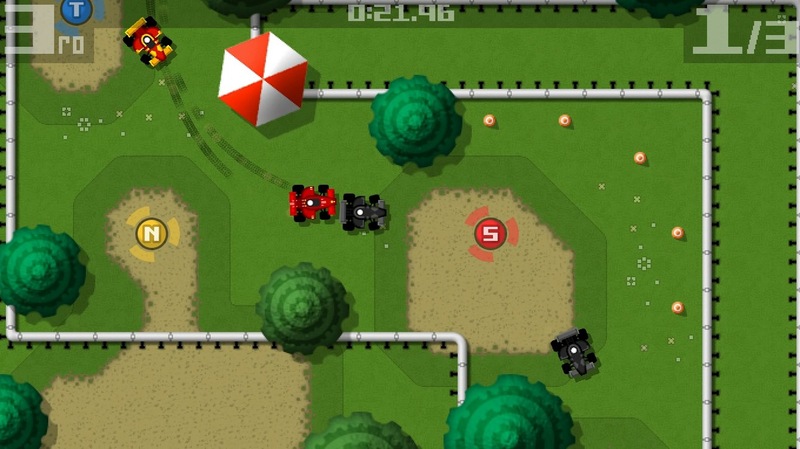 There are six cars, 18 courses, and a two player head-to-head mode. No track previews, no tournament mode, no sliders for number of laps or damage scaling. Just a "next race" menu button. This makes it quick to pick up, but too easy to burn through. After a single casual evening I had podium finishes on every track, and wasn't sure what to do with myself. There's a leaderboard in place to encourage going back to try for the best time you can get, but the semi-random nature of the pickups makes it a weird fit for time trial runs. The stat pickups are the only gimmick the game really puts forth. Each car has three stats: Top Speed, Acceleration, and Tires. 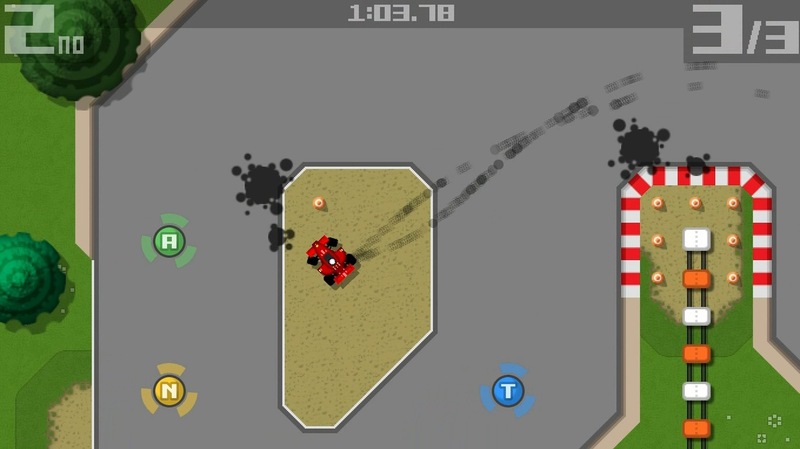 The track is randomly sprinkled with corresponding pickups that will increase each stat for the remainder of the race, in addition to the Nitro bonuses that give your car a short-lived boost. The location of the pickups are set per track, but which pickup is in each spot seems randomly set. And there are so many pickups that before the end of the first lap your car will feel noticeably different, but the change will differ from race to race. After starting this review on a bit of a downer, lets look at what Retro Racing does right. I really can't speak enough about how much I like the feeling the physics model. The sense of speed is never so overwhelming that you slam into walls because a turn jumped you from off-screen. Steering is arcade tight with just enough lean-in, and when you do inevitably break loose the sense of inertia is super satisfying. The game ran incredibly smoothly on every piece of hardware that I have tried it on, including during split-screen on a ist generation iPad. Getting all those tactile nuances just right is no easy feat, and I would say I haven't felt it quite this right in 2D since Death Rally in 1996. The multiplayer races (exclusive to non-mobile formats) are undeniably fun, and it is really refreshing to play a game in local split screen mode again. The two-player limit is understandable on the desktop versions, but it is a shame that this wasn't upgraded to four-player for the Ouya. Also, similar to one player mode, multiplayer is screaming out for a proper multiplayer 'best of three' or hosted tournament consisting of various tracks without you having to resort to organising this yourself. In conclusion though, playing Retro Racing is a fleeting experience; the whole time you're playing you're thinking of other games. Everyone has their own 2D nostalgia point, but having 'Retro' right in the title makes you think of all the other modern releases trying to be a retro-styled racer. Real World Racing, Rush Rush Rally Racing, or the 10 year old but still active Gene Rally. Even the 2011 remake of Death Rally. All these games have cores that aren't as smooth or satisfying as Retro Racing, but they do build on those cores to create something unique that keeps you engaged. There's nothing wrong with Retro Racing, it's actually pretty enjoyable. There's just not enough of it, and I left the game feeling unsatisfied. When I ended up with no more tracks to play, instead of replaying previous circuits I found myself returning to Gene Rally for my top-down racing fix. Nick Korn has pretty much covered all of Retro Racing's shortcomings above, but I can't help but feel a little defensive on behalf of the developer here. 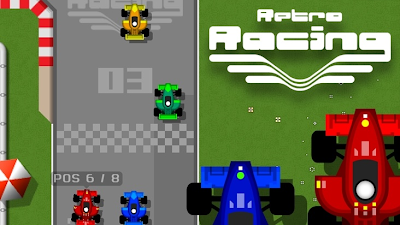 Retro Racing is very much a game primarily designed for and to be played on mobile plaforms, and if it wasn't for its simple 'pick up and race' nature it would not have done so well on Android and iOS. The physics and controls are indeed fantastic, and there is a lot of fun to be had unlocking all the tracks. 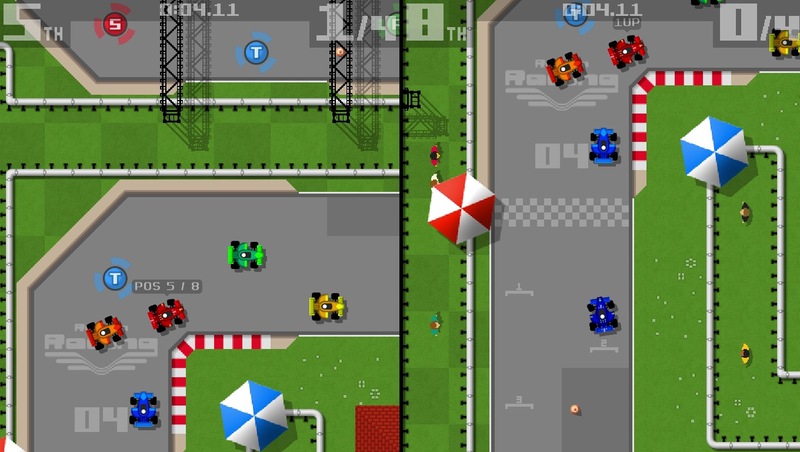 In brief, Retro Racing is an essential purchase on mobile. It's on the desktop and Ouya versions that the 'casual mobile game' issues really become evident. 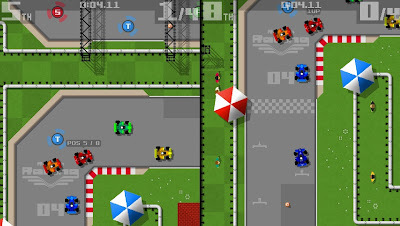 On these platforms the game could have been much more refined; it feels super-generic and lacks the personality of the much loved Wii/Dreamcast hit Rush Rush Rally Racing, and the lack of any structured tournament mode really hurts the lastability. I confess that I was actually annoyed when I bought the game to discover that the additional cars were all unlocked immediately. Call me old-school, but I prefer play to win, not pay to win; these cars should/could have been awards for beating tiers of races. Another feature (aside from a four-player mode) that would have greatly benefited the game is a workshop; I'd love to be able to give my car a custom paint job and reassign limited stats via sliders to create a vehicle suited to my own playing style. 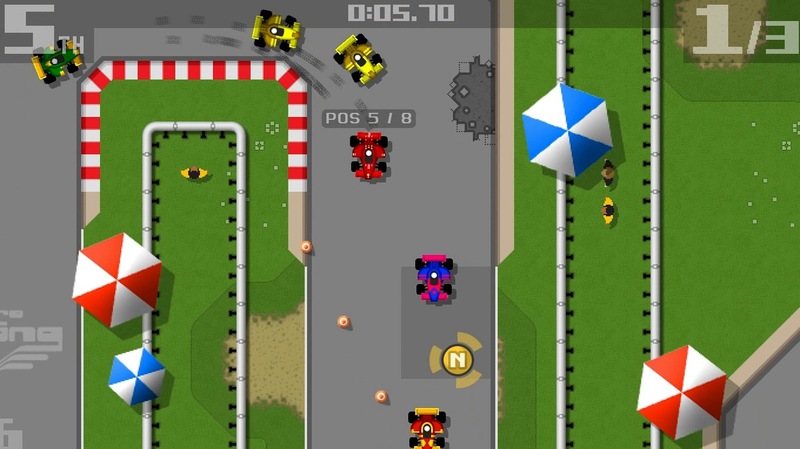 A Micro Machines 'drop off the rear of the screen and lose' battle mode would of course been the cherry on top of the pie. Retro Racing is a fantastic mobile racer, and in my opinion has potential to become one of the best desktop/console top-down-racers too. I really, really hope that sales are sufficient enough for Jamie Woodhouse to invest more time into giving these formats some further attention.